I’m on a mission to get people to think outside the herb box when it comes to their yards. Sure, it’s easy enough to plunk a basil plant in the garden window for fresh basil nearly all year long, or to sow a little patch of chives in a pot and trim them with a scissors when you need some green confetti to dress up a soup. And in Southern California and other moderate climates, rosemary grows year ‘round and is used as a landscaping plant, so it’s common for nearly every suburban house to sport a rosemary bush of some kind. This is serendipitous for the enthusiastic home cook. But I want you to think bigger. Think vegetable garden, think little patch of dirt, and think kale. 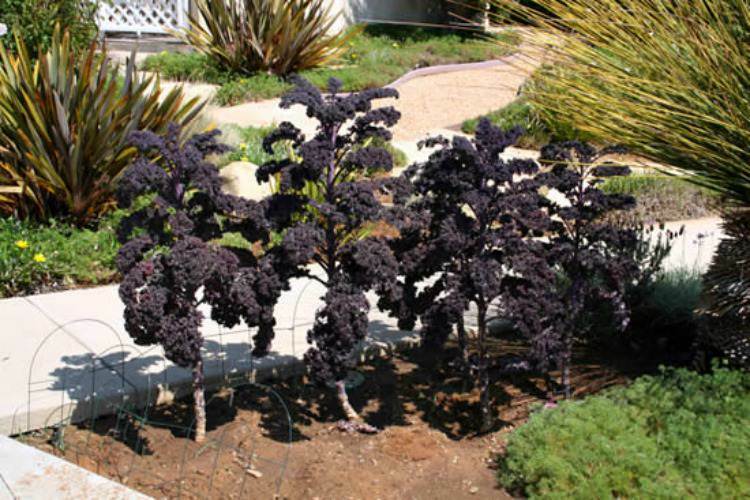 I have found kale extremely easy to grow here in Southern California. Last year I planted Lacinato kale (aka dinosaur kale, Tuscan kale, Cavolo Nero or black kale) from a 6-plant pony pack, and it took off like wildfire — gorgeous dusty-green, bushy kale plants. As the weeks wore on, I continued to harvest the lower leaves, making a popular lemony kale salad with garbanzos and tuna, a spritely kale salad with creamy avocado and bright blood orange, and a knockoff of a Trader Joe’s kale salad that is better than the original. I also gave lots away. We were on a kale bender! And then a funny thing happened. They continued to grow, turning into veritable small kale trees, 5 feet tall. We were in tall corn..eh..kale! As they flowered, I experimented and left them in the ground, harvesting leaves going on several months. 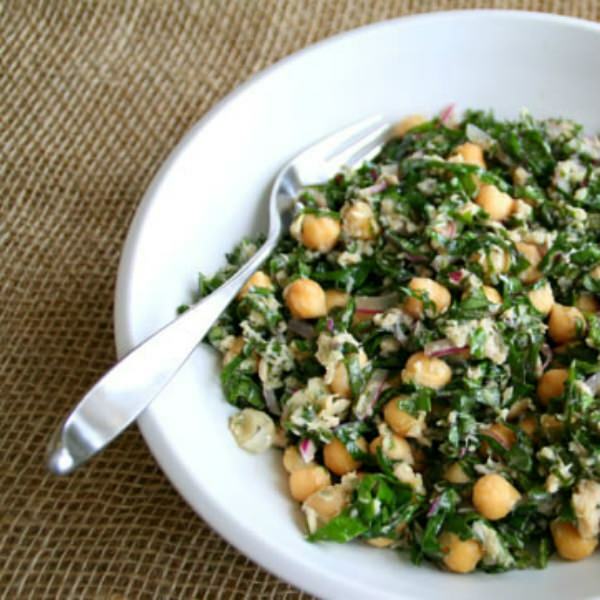 I could have kale in my recipes whenever I wanted, and I threw it in everything – a smoky garbanzo soup, a beans and greens skillet, and morning smoothies. But my restless gardener soul wasn’t satisfied. Could I perhaps grow different varieties, and where would I put them, anyway? My yard is small, and I thought I was plumb out of room. One day I was gazing out the front window, though, and looked at my front parkway. You know, the little spot between the curb and the sidewalk, where most of us grow grass. I don’t do grass, but mine is filled with hardy shrubs and whatnot…nothing memorable. It was dirt. Why couldn’t I grow kale there? I could, and I did. I turned some compost, blood meal, bone meal, peat and other amendments into a patch of parkway dirt, planted a pony pack of a variety called Redbor kale, watered and waited. It took off immediately, even in that poor-ish soil, and soon I had a small magenta crop of the prettiest purple kale you ever saw. I put a garden marker sign out there to answer the question of what it was, and a little metal temporary fence to distract any passing dogs who might think it looked like a fire hydrant. It worked! I say seize your land and use it, wherever it is. My neighbors have embraced my new kale “trees” in the front. I’ve heard some of them comment on it as they walk by on their daily constitutional. Passing dogs are simply bored (thank goodness); there hasn’t been even one sprinkle. Some cities or communities might not be so welcoming. A man in Missouri had to fight city code enforcers for the right to have a productive kitchen garden (or yarden, as he called it) in his front yard. 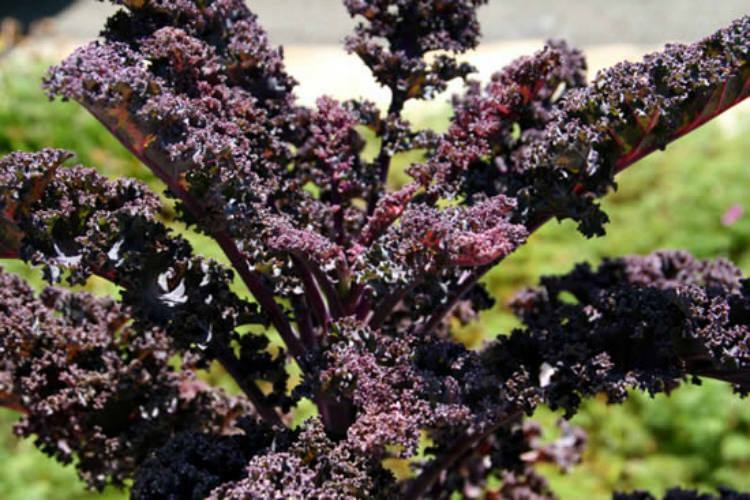 The city of Oakland wanted to fine a woman $2,500 for growing chard in a vacant lot. And bureaucrats in Quebec tried to shut down a couple who tore out their sod and planted a big kitchen garden; tens of thousands of supporters rallied behind the urban farmers. The benefits of growing your own are that you can be certain the plants are not sprayed with any pesticides, and you control how long the leaves are on the plant, when to harvest, and which varieties to plant. The downside, of course, is aphids, and sometimes a cabbage worm or two. Pluck off the worms and dispense with them; let your conscience be your guide. I squish them with gusto. The aphids are a bit trickier – they tend to cluster on tender new growth at the top of the plant, so rub them off with your fingers (gross! ), spray them off with water, and use my trick of spraying them with some rubbing alcohol. Don’t mess with MY kale, danged bugs! But I encourage you to embrace the imperfect leaves, the greenery with a bug hole or two. Who cares? Wash it off, chop it up for your salad or soup, and no one is the wiser. And let me tell you another secret. Kale is the darling of the moment, for all the right nutritional reasons, but kale is in the 13th minute of its 15 minutes of fame. Waiting in the wings are pea shoots. Pea shoots are the new kale. You heard it here first, and you know what? They’re even easier to grow! Thanks, Dorothy! What a great idea! I’ll try it next spring. In the meantime, I’ll try some kale recipes so I can be ready for my bumper crop! You’re welcome! Depending on where you live, you might be able to grow it now and through the winter. Ah, you have inspired me! But I have so many pests, it’s hard to grow basil (and those are just my neighbors). We can always count on you for a laugh! But seriously…try the kale. You might find that the pests are not as prevalent on it. Amend your soil first though. We have notoriously poor soil here in the housing tracts in So Cal. Jayne, you shouldn’t have to go to the slammer just for planting spinach! 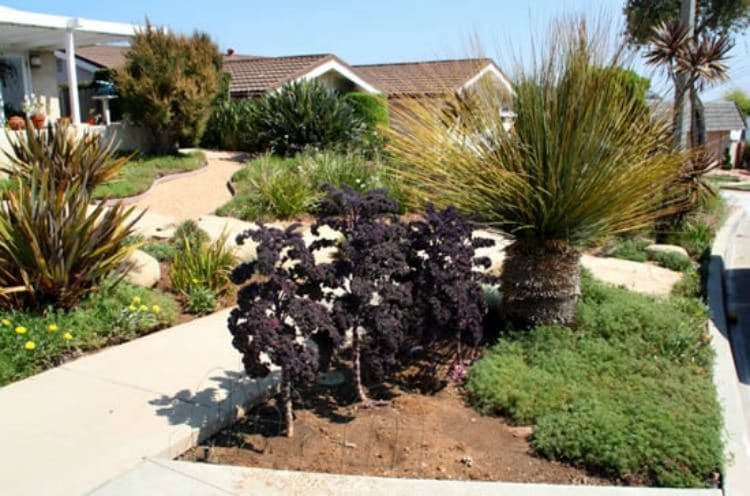 Seriously, if you Google for images of “front yard farmer” or “front yard garden” you’ll find lots of inspiration for how to do it and make it attractive! Good luck and so glad you want to do this! Great post- I’m inspired! Kale is going into my yard now; and I am getting the plant from a grower at my farmer’s market. Looking forward to trying out several of your recipes. Love it. So glad you found inspiration! I linked up a bunch of kale recipes in the bottom photo array. Check ’em out! You can throw kale into just about anything, to good effect.